1). 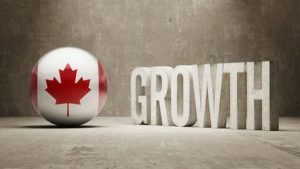 Canada’s economy will continue to under perform the U.S. as growth slows to 1-3/4% in 2019 compared to just over 2% in 2018. For the U.S., where budget deficits have been rising sharply with the 2018 tax cuts, growth this year will hit about 2.4% compared to nearly 3% last year–an over-heated economy to say the least. 2.) Canada’s population growth will lead the G7 by a wide margin. In 2018, Canada’s population was on track to increase 1.4%, the most robust pace in 18 years and double the 0.7% rate for the U.S., which was the G7 country with the next-highest population growth rate. Despite this, spending did not rise —auto sales fell on an annual basis for the first time since 2009, while home sales had their second biggest slide in the past 20 years. Per capita GDP growth in Canada this year will under perform most of the G7. 3.) Canadian consumers are tapped out as debt levels remain high, interest rates edging upward and credit is less readily available. Boomers are wary that their homes are worth less than what they were counting on as Canada’s two largest housing markets experienced decade-low sales last year with softer prices especially at the pricier end of the single-family home market. First-time buyers might have more homes to choose from in some markets, but regulators have tightened qualification rules. Foreign buying has slowed owing to foreign purchaser taxes in Toronto and Vancouver and speculation taxes in Vancouver. 4.) The Fed and the Bank of Canada will raise rates in 2019 by more than the market currently expects. Market participants in recent weeks have reduced expectations for rate hikes by both central banks to barely one increase apiece. More likely, both the Fed and the BoC will raise the benchmark overnight rate twice each this year. Even with these actions, monetary policy in both countries will be slightly accommodating with interest rates still below neutral levels. 5.) Even with only modest rate increases in 2019, consumers will be impacted because they are so heavily exposed to debt. Economists at the Royal Bank estimate that the average household faces a $1,000 hit from rate hikes. This would imply that the average household principal and interest payment will increase by 7.6% in 2019. 6.) This effect will be offset by stronger wage growth as labour markets continue to tighten. Labour shortages will finally add to wage growth. The unemployment rate hit a record low in December, yet wage growth had slowed to only 1.5% year-over-year, well below inflation. Over the next decade, more than 270,000 people will retire from the Canadian labour market every year. Immigrants and temporary workers will replace some of these retirees, but not all. 7.) Rising interest rates will squeeze government spending for the feds and provinces with significant debt loads. Ottawa will spend more on debt payments than any other program except elderly benefits. 8.) Corporate balance sheets will be negatively impacted by higher interest rates as Canadian companies borrowed more heavily than their international counterparts. Canadian companies remain less competitive as their productivity growth has lagged their global competitors. Efforts to improve Canadian competitiveness are in process but have yet to show meaningful results. This has been a secular problem for Canada. 9.) Canada could be caught in the crosshairs of a U.S.-China trade war, but free-trade deals with Europe (CETA) and China (CPTPP) will reap benefits, particularly as the U.S. continues to alienate many of its allies and trading partners. Canada must diversify trade away from the U.S., particularly in the oil sector, which requires massive infrastructure spending. No longer can we count on exports of oil and transportation products to the U.S. to be the mainstay of Canadian global trade. 10). Comparable to last year, housing in 2019 will not fuel Canada’s national economy, thanks to macroprudential policy measures and modestly higher interest rates. Housing accounted for a record-high percentage of overall economic growth and job creation until early last year.We are barely off those peak levels now, so any slowdown in housing activity will have a disproportionately large negative impact on the economy–the flip side of its disproportionate expansionary impact over much of the prior decade. Bottom Line: Sales to new listings have stabilized in Toronto, but continue to decline in Vancouver. Population growth in Vancouver has under performed Toronto’s for two years, while supply, mainly in the high-rise segment, has risen sharply. In consequence, the number of completed and unabsorbed units in Vancouver continues to increase, while that measure is still trending downward in Toronto. The sector of most significant weakness in Toronto will continue to be in the pre-sale low-rise market where there remains considerable excess supply.